Disclosure: This is a sponsored post on behalf of SheSpeaks/P&G. All opinions expressed are my own. Every flu season it seems that we hear that it's worse than the one before - does it seem like to you? Up here in New Hampshire the flu seems to be running rampant and almost daily I hear about another family that's under attack. We've had our own bout of sickness in our household that started just before Christmas. It began with a cough and even spread to baby Grayson - his situation was made worse by teething. It's amazing how sickness can morph within a family! We had a couple weeks of the kids having high fevers off and on, doctor visits, prescriptions and the like. I have to admit I didn't get the flu shot prior to having kids, but this season we were well-prepared (Gray has a booster coming up). In the 5 years of getting our shots we haven't actually caught the flu, but with every little symptom we feel Mr. Lovebird and I get nervous - when the caregivers and providers go down, it really gets hard! Mr. Lovebird is an avid DayQuil and NyQuil user while I've taken NyQuil in the past only to wake up feeling groggy the rest of the day. We needed to restock our medicine cabinet this flu season so when the opportunity came to give Vicks DayQuil and NyQuil Severe Cold & Flu a try and it coincided with Mr. Lovebird not feeling well, I asked him to be my guinea pig! 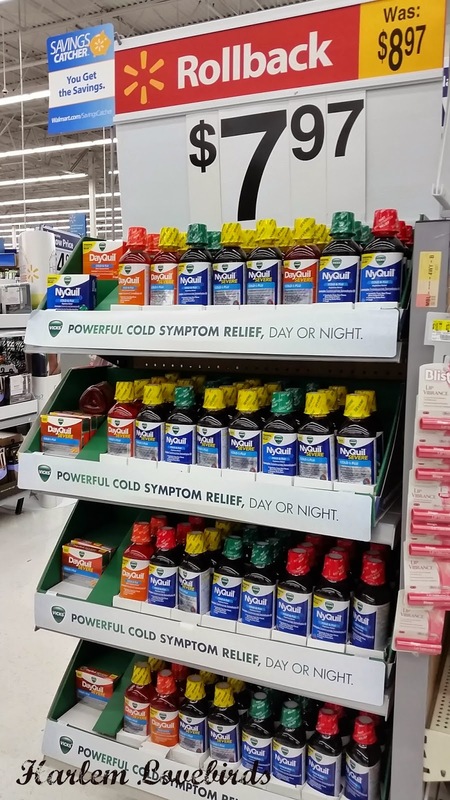 My local Walmart was well stocked for flu season! He was surprised to see "Severe" on the packaging so I explained how it had maximum symptom-fighting ingredients allowing him to take back his night (if only we could take back our nights from the kids coming into our bed! ), and he happily took his dose and went to sleep. In the morning I stared at him and asked, "So...?" He exclaimed, "I feel awesome! No medicine head and so much better." I was impressed and even asked if he needed me to serve up a dose of DayQuil as well before he hit the road for his daily meetings. He was so confident in how NyQuil worked that he declined. Thankfully, his symptoms didn't worsen, but we're definitely still on flu alert here in New England (Nia's school recently sent home a warning). Knowing my husband wasn't left with medicine head makes me more apt to try it should I get symptoms as well. I'm just glad that I haven't succumbed to the flu this season, but I remember last year when I was pregnant the flu restriction at the hospital went all the way until Grayson was born. That's June 27! As a result Nia couldn't go on a tour with us (we had to wear masks), but was able to visit when he was born. Concerned about this year's flu season? You can purchase Vicks DayQuil and NyQuil at Walmart and pick up your other wellness needs like Puffs tissues, ingredients for chicken soup and a warm blanket. Follow @Walmart on Twitter and Vicks Nyquil and DayQuil on Facebook to stay on top of the latest product news! How's flu season treating your family this year? Stay healthy friends!